This delightful salad is packed with flavor and is super healthy. The dressing is light, simple to make and also nutritious. It’s that time again, back to healthy eating. Personally, I am happy to put an end to the overeating. I hate the feeling the next day and it’s just not worth. I am excited to start feeling light again and I am going to start with this delicious, nutritious salad! Did I mention how pretty it is? What prompted me to make this was my leftover Roasted Butternut Squash I had in the refrigerator. I wanted to make something easy but also substantial. I made farro because I had some in the pantry (and I love its crunchy texture! ), but you can substitute with quinoa, wheat berries, barley or any other grain you’d like. I also had some of my homemade Candied Pecans left over from the holidays which are always the perfect complement to any salad. And pomegranates because…you know, pomegranates. I always have them in my refrigerator too because my 6 year old might love than even more than me! The dressing I whipped up is so ridiculously easy to make, it feels weird to even call it a “dressing”. 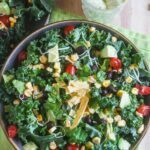 I wanted to keep this salad and light and easy and it just so happens that the dressing is amazing! Feel free to add sliced chicken and cheese (if you’re not vegan). I bet a crumbled cheese would work great on top of all of this goodness. Prepare the faro as directed on the box. Mix together the ingredients for the salad. 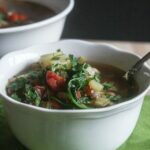 Prepare the dressing by mixing together the vinegar and maple syrup in a small bowl. Pour over salad and mix again. So who wants to jump on the healthy bandwagon with me? Let’s support each other and build a community to help maintain our healthy lifestyles together! Together we can make 2016 our healthiest one yet! This looks absolutely incredible and I love the pops of color! Happy New Year Lauren – this is such a gorgeous salad! 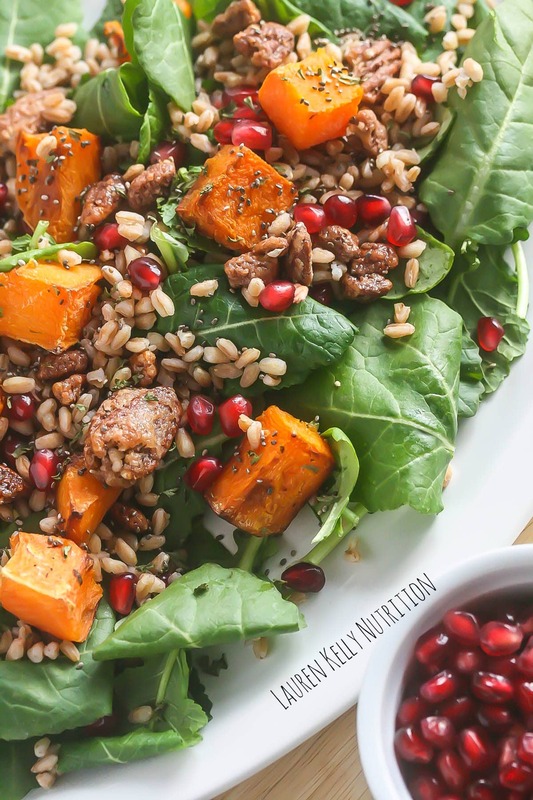 I had to come by after seeing it on FB – I so love the pom seeds and farro combined with the squash and greens! Such a delightful combo of tastes and textures! Oh thank you so much Shashi! Happy New Year! Lauren, this is a perfect meal! 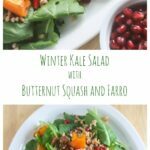 I am a huge farro fan and butternut squash is a great complement to it. Thanks! This is one of the most gorgeous salads I have seen! I love the dressing on this! I use maple syrup a bunch in dressings. This salad! Fabulous and so pretty! I love farro, so I’m super interested in putting this on my menu! 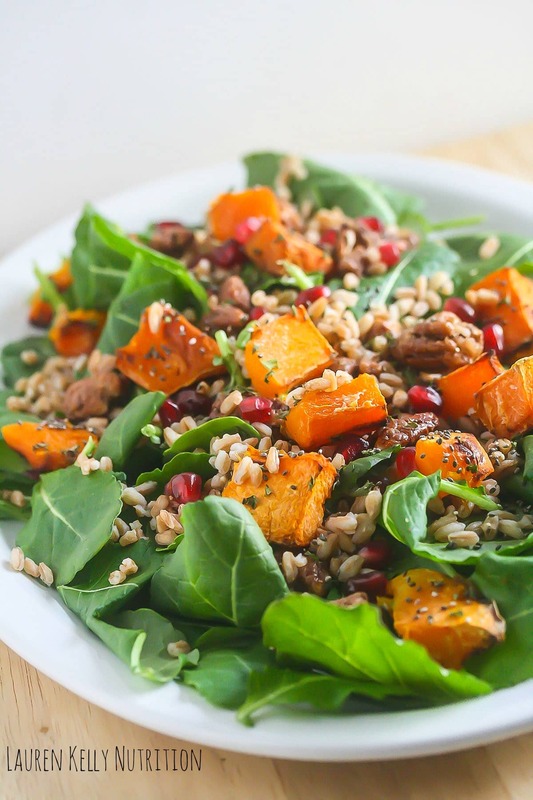 Such a wonderful way to start the new year right – with a gorgeous healthy salad! What a gorgeous salad. I love all the flavors and textures you’ve combined here. Farro is my favorite grain and one that I’m trying to use more of. 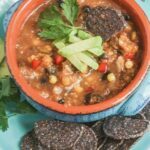 WOW, this is absolutely gorgeous and I love all the flavors and ingredients in this! I didn’t really overeat during the holidays, but I did maybe have a few extra cookies than I normally do! It was hard to resist! But I am totally ready for a fantastic salad like this. Love all the flavors (and the maple syrup in the dressing!). Happy new year, Lauren! This looks fabulous Lauren, it’s so pretty and inviting. I’m a huge fan of farro, it’s one of the few things I can eat without pain. So I keep some in the pantry at all times. Is it bad that I’m not ready to stop the indulging yet? Ha. K doesn’t go back to school till Thursday. University starts later so we’re still whooping it up. Just ordered pizza. At this rate I’ll need bigger pants soon. 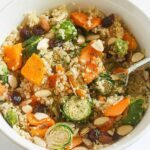 Lauren – this salad looks absolutely scrumptious 🙂 Have never made farro before but I’m willing to give it a try. Plus – hello – butternut squash – love it! Happy New Year! I love everything about this colorful salad! Can’t wait to try it! This kale salad is the perfect way to welcome the New Year. Plus these pictures are totally amazing! I want this salad ASAP! I am loving this salad! Just the color alone makes me want to grab a fork! And I love adding butternut squash to salads! I love, love, love the sound of this salad (and the ridiculously simple dressing!). 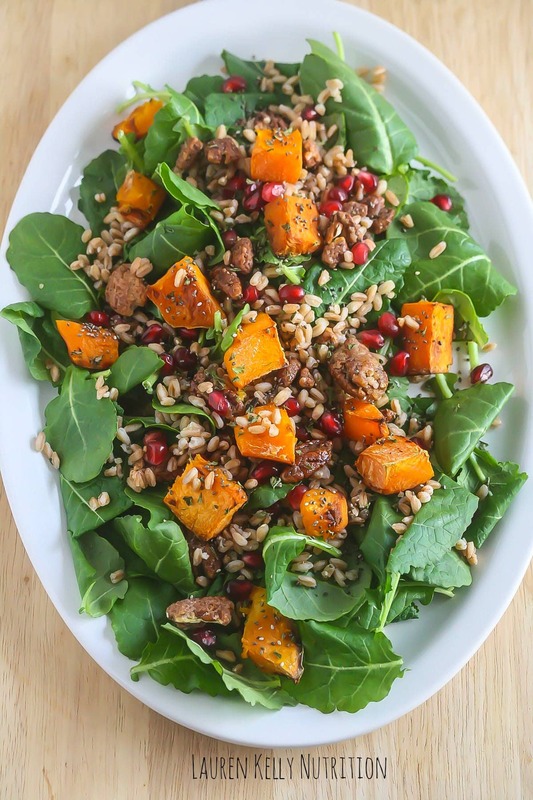 Grains in salad are a favorite of mine — and butternut squash makes it perfection.